Cricket Career BigInnings RPG is an action packed cricket game unlike any other. Create and take control of your own player and start your cricket career as a batsman, bowler or all-rounder in this brand new cricket RPG game. 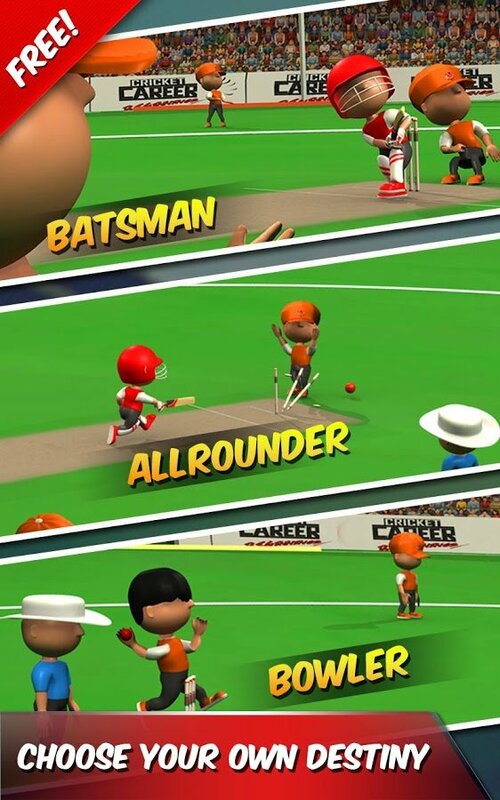 Unlike the other most popular cricket games, here you will get to create your own cricket legend in this complete cricket game. Using a mix of innovative mini games and our revolutionary matchplay simulation engine, get ready to experience the game of cricket like never before! Enjoy this mix of 3D cricket with our colorful illustrative take on what cricket games should be like. Take control of your created cricketer and play through multiple years of league and tournament T20 cricket. By utilizing exciting RPG elements like equipment and skill upgrades, get ready to experience a cricket game unlike any other in existence. Ease your world cup cricket fever for a bit and INSTALL now. If you like games like Stick Cricket, Stick Cricket 2, Power Cricket T20 and Real Cricket 2014, check this game out. You will be amazed at what could be one of the best cricket games ever. - Unique Single-player Career - Batsman, Bowler, All-rounder. Download now and and satiate your world cup cricket fever with this awesome new power cricket t20 type game. Be on the lookout for our new world cup cricket release, Cricket Career: World Cup 2015, coming soon. There is no better medication for your world cup cricket fever than a good game.